Save 10% and have your order automatically shipped and your card charged every 30 days until you cancel. 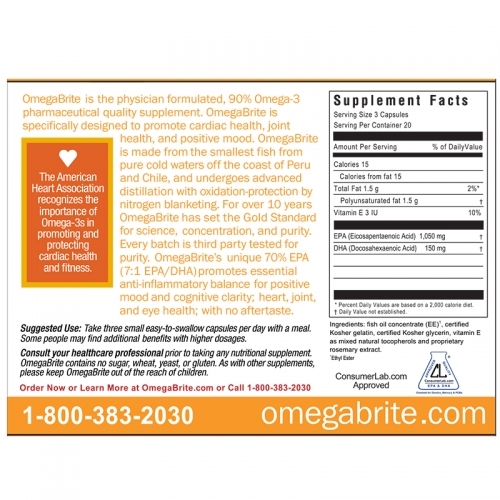 OmegaBrite 100% Natural Advanced Omega-3 Formula. You can change or cancel your automatic refill program at any time by calling our toll-free number 1800 940 068 or by contacting updates@omegabrite.com. Your order can be changed or cancelled at any time until it has gone to our shipment centre. We provide a money back guarantee and you may return for up to 30 days for a full refund less shipping. 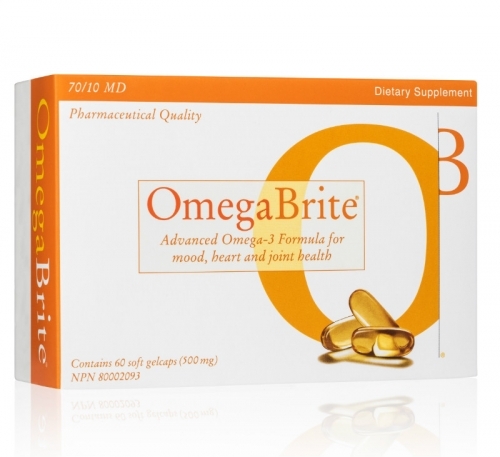 We are confident you will like OmegaBrite and find that most of our customers find the best benefits after 2-3 months. 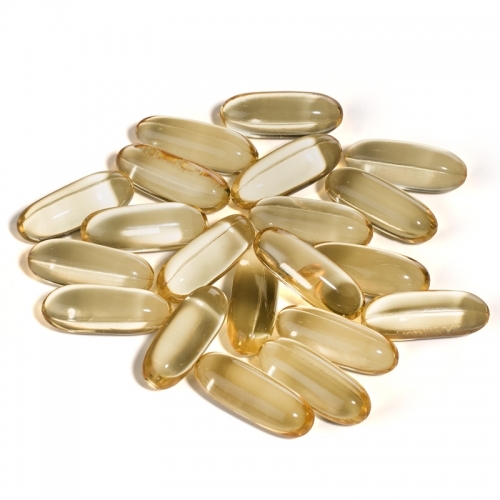 So be patient and allow your body time to replenish your cells with Omega-3. You are requesting and authorising us to automatically ship your order and charge your credit card for the order you selected, including shipping and handling, and tax, on a regular basis every 30 days until you cancel, which you can do anytime, effective five days after the date you cancel. Your first order will charge and ship generally within 24 hours of you placing it. Your AutoRefill program then automatically creates new orders for you, and charges your card and ships your products, according to the frequency you specified (so, if your frequency is 30 days for instance, then your next order would be automatically created 30 days from the date of your first order, then 30 days from that date, and so on and so forth), and continues indefinitely until you decide to cancel. (The time period between each AutoRefill order and the next one is referred to herein as the “Subscription Period”).Its important to understand that by enrolling in AutoRefill, usually by purchasing an AutoRefill product, you are requesting that we automatically charge your card and ship your product to you according to your chose frequency (usually every month) with no set end date, meaning you have to go into your OmegaBrite account or contact us to cancel it. That cancellation will apply to the next order at least 5 days from the date of cancellation (to cancel your next immediate order in your AutoRefill program you must cancel at least five days prior to the date its currently scheduled to be generated, otherwise the cancellation will apply to the subsequent order). Remember, if you ordered multiple AutoRefill items, even if you receive them in the same order, you must cancel EACH AutoRefill programs separately. 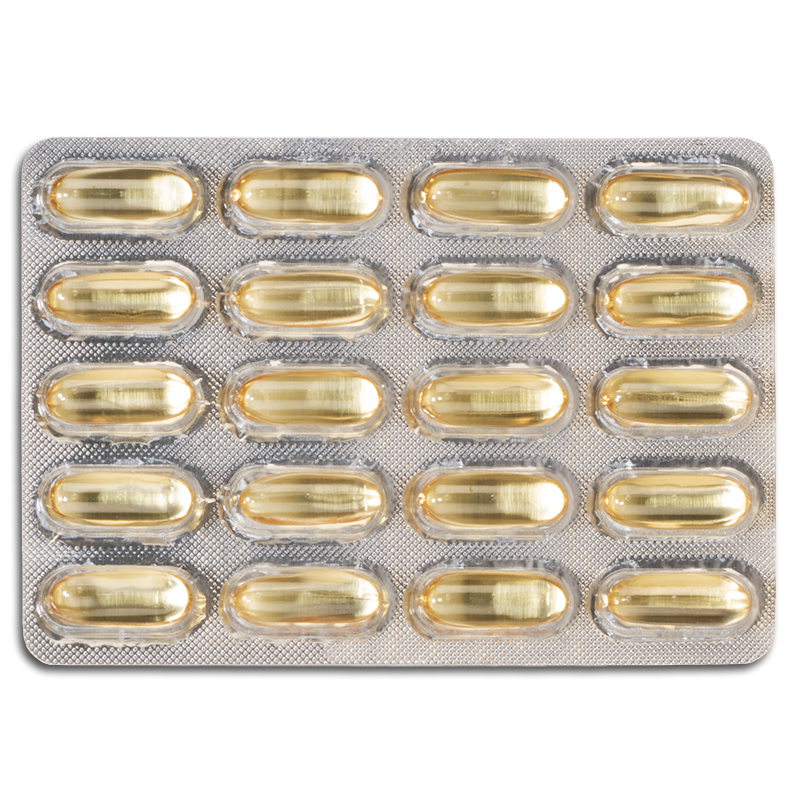 Performing a cancellation on one AutoRefill program has no effect on any others you may have. By proceeding with your order and completing the checkout process, you are thereby consenting to the above and are thereby authorizing each of those purchases and corresponding credit card charges. Call us at (0044) 8000 443 224 or email us at updates@omegabrite.com and request that we cancel your AutoRefill program (you should include reference to your full name, billing address, and subscription ID in your email or have the same on hand when you call). Email or mail it to us at updates@omegabrite.com, (0044) 8000 443 224, or GoLife Ltd., 25/28 North Wall Quay, Dublin 1, Ireland, respectively. *If you choose to mail the form, then the cancellation will apply five days from the date we receive the form, not the date you sent it. You may adjust your frequency at any time yourself by contacting us at 1800 940 068 or updates@omegabrite.com. Your adjustment will apply to the order after the next order in your AutoRefill program (so your next order will go out on the date it was already scheduled to, but the AutoRefill program will calculate the one after that based on your updated frequency). Your change must be received within five days of your next order or it may apply to the next order after it (so if you make your adjustment within two days of your next order, the AutoRefill program may calculate the one after it with the current frequency, and use your updated frequency to calculate all ones after that one). 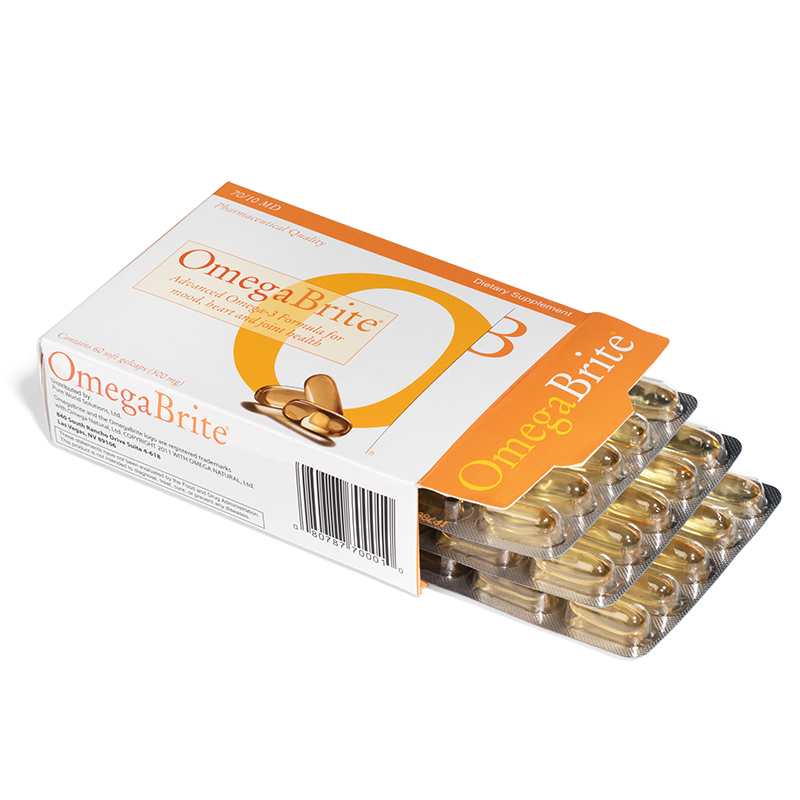 If you wish to adjust the date your next order will ship and charge, or skip an order, you can do that also yourself by contacting us at (0044) 8000 443 224 or updates@omegabrite.com. This will affect your immediate next order, but then the AutoRefill program will calculate the order after that based on the current frequency as usual. Your change must be received within five days of your next order or it may apply to the next order after it (so to adjust the date your immediate next order will ship and charge, you need to make the adjustment at least five days prior to the currently scheduled date). Your payment to OmegaBrite will automatically renew at the end of the subscription period unless you cancel your AutoRefill program by contacting us at 1800 940 068 or updates@omegabrite.com at least five days before the end of the current subscription period. The cancellation will take effect five days after the date you make or give us notice of the cancellation. Orders that have already been generated, regardless of whether you have received the orders or they are still processing or in transit, and orders already scheduled to be generated within the next five days cannot be cancelled and, except as expressly provided in these terms, OmegaBrite will not refund any corresponding fees that you have already paid or are scheduled to pay for the aforementioned orders, therefore it is important to understand that if you desire to cancel your next AutoRefill program applicable to your next order, you must do so at least five days before it is scheduled to be automatically created. The limitation section sets forth further terms relating to the cancellation of your AutoRefill program. AT THE END OF YOUR INITIAL SUBSCRIPTION PERIOD (THE NUMBER OF DAYS YOU SPECIFIED AS YOUR FREQUENCY AFTER YOUR INITIAL ORDER DATE, OR IN CERTAIN CIRCUMSTANCES, THE DATE YOUR INITIAL ORDER IS CHARGED AND SHIPPED) WE MAY AUTOMATICALLY START TO CHARGE YOU FOR THE APPLICABLE AUTOREFILL PROGRAM, ON THAT FIRST DAY FOLLOWING THE SUBSCRIPTION PERIOD, ON A RECURRING BASIS AT THE END OF EACH SUBSCRIPTION PERIOD THEREAFTER UNTIL YOU CANCEL PER THE CANCELLATION TERMS AND CONDITIONS LAID OUT IN THESE TERMS HEREIN. BY PROVIDING YOUR PAYMENT DETAILS IN CONJUNCTION WITH THE AUTO-REFILL ORDER, YOU AGREE TO THIS CHARGE OR CHARGES USING SUCH PAYMENT DETAILS. IF YOU DO NOT WANT THIS FIRST CHARGE, OR ANY SUBSEQUENT CHARGE, YOU MUST CANCEL THE APPLICABLE AUTO-REFILL PROGRAM OR PROGRAMS THROUGH YOUR OMEGABRITE ACCOUNT’S SUBSCRIPTION PAGE OR BY CONTACTING US BY EMAIL AT UPDATES@OMEGABRITE.COM OR BY PHONE AT (0044) 8000 443 224 AT LEAST FIVE DAYS BEFORE THE END OF THE YOUR INITIAL SUBSCRIPTION PERIOD, OR FIVE DAYS BEFORE THE END THE APPLICABLE SUBSCRIPTION PERIOD, RESPECTIVELY. AUTOREFILL PROGRAMS, WITH RESPECT TO THE ORDER SCHEDULED TO AUTOMATICALLY GENERATE AT THE END OF THE CURRENT SUBSCRIPTION PERIOD, CANNOT BE TERMINATED ONCE THE CURRENT DATE IS, OR IS LESS THAN, FIVE DAYS FROM THE END OF THAT SUBSCRIPTION PERIOD. EXCEPT AS EXPRESSLY PROVIDED IN THESE TERMS, OMEGABRITE WILL NOT REFUND ANY CHARGES FOR ORDERS THAT EXIST ALREADY AT THE DATE OF CANCELLATION, OR THAT WILL BE CREATED WITHIN FIVE DAYS OF THE DATE OF CANCELLATION. THE LIMITATION SECTION SETS FORTH ADDITIONAL TERMS REGARDING CANCELLATION OF YOUR PAID SUBSCRIPTION. 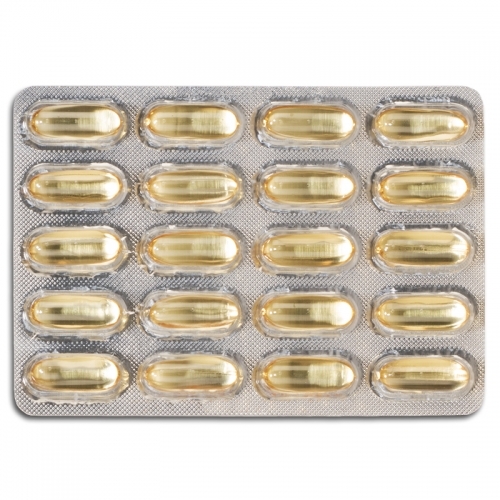 OmegaBrite may change the price for its products and its AutoRefill programs from time to time and will communicate any changes in price to an existing and active AutoRefill program of yours to you in advance. 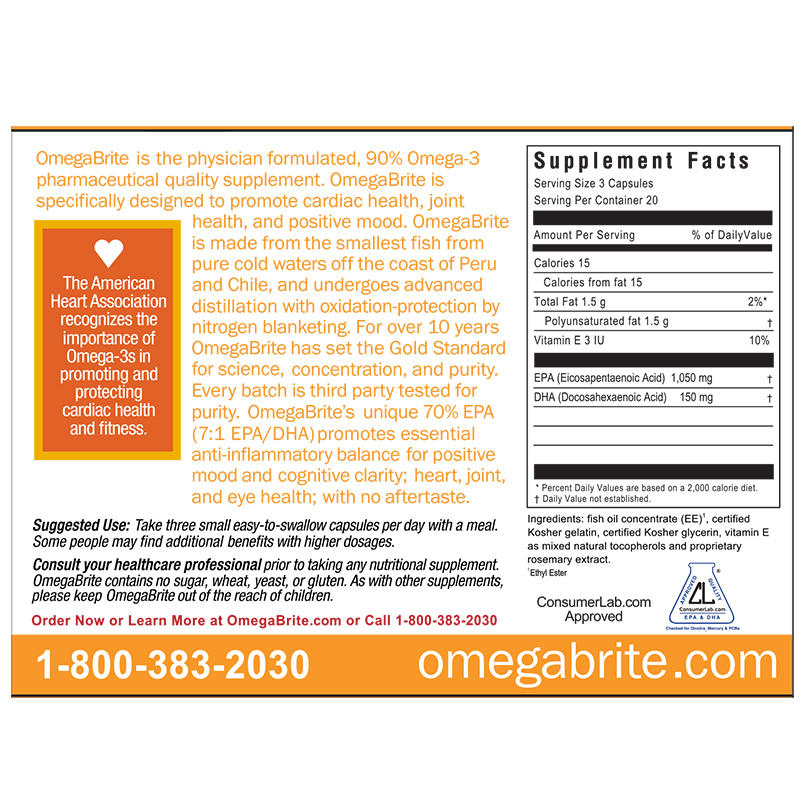 OmegaBrite has no obligation to communicate to you any price changes to its products unrelated to AutoRefill or to its AutoRefill products and programs that do not effect an existing and active AutoRefill program of yours. We may communicate these price changes to you via one or more of email, fax, mail, or telephone, at our sole discretion. For the purposes of these Terms, you agree that our communication to you of the price changes shall be deemed received five days after the date OmegaBrite sends you notice of the price change (not the date you receive such notice) (the “Notice Date”). The date of an applicable price change for an AutoRefill program will be the date that is exactly three months following the Notice Date. Price changes for AutoRefill programs will take effect starting with the order that is generated following the Subscription Period the date of the price change falls under. As permitted by local law, you accept the new price by continuing to use the Site and continuing to receive without cancelling your AutoRefill program orders after the price change takes effect. If you do not agree with the price changes, you have the right to reject the change by cancelling your AutoRefill program per the cancellation terms and conditions set forth in these Terms, prior to the price change going into effect. Please, therefore, make sure you read any such notification of price changes carefully. 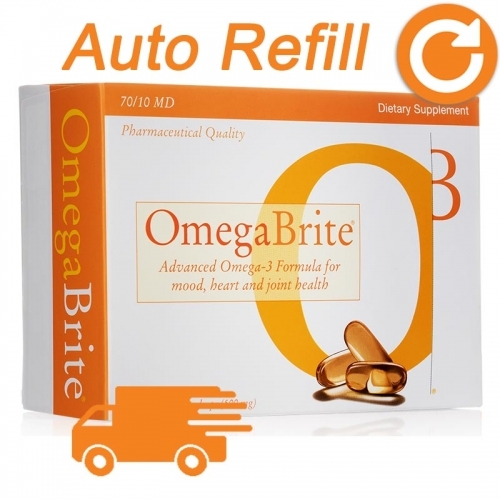 If you have or had an AutoRefill program that was deactivated for any reason, whether by your cancellation, issues relating to payment or credit card decline or expiration, or any other reason, OmegaBrite makes no guarantee that the price you were receiving will be the current and applicable price if and when you reactivate or open a new AutoRefill program, and, notwithstanding the foregoing, OmegaBrite is under no obligation to follow the notice procedure or timeline laid out above; instead, your reactivation or reopening of the AutoRefill program constitutes your acceptance of the price. OmegaBrite has no obligation to maintain a uniform price for its AutoRefill customers, and you expressly agree that OmegaBrite may have various price levels for its AutoRefill customers at any one time, corresponding to any of a number of factors, including but not limited to how long the AutoRefill program has been open. If you enrolled in AutoRefill prior to this version of the Terms coming into effect, you accept this provision on price changes to AutoRefill programs and its application to your existing AutoRefill program or programs by continuing to use the Site and continuing to receive without cancelling your AutoRefill program orders after this version of these Terms come into effect.